I'm sorry about that. Due to spam issues we have set up a system that checks all contents created. Our system may have unpublished your content as spam. But don't worry we regularly check the filter and we'll republish it. Would it bo possible to have the following nodes republished? Hi, I'm having same issues here. Would you be able to have a look at these links for me? It looks like the posts were caught in the spam filter. It should be resolved now. Can you please publish this? The content not available issue is coming up again: https://h5p.org/h5p/embed/87995. Would it be possible to republish this? My apologies; is there any way I can avoid this issue? Is it the class code number I'm using? Would it be possible to republish this? My apologies; is there any way I can avoid this issue? Apologies for the inconvenience. I suggest that you edit the name of your content so that the spam filter will not think that it is spam. Use the tag instead so that you can track your work. It should be published now. I'm not sure why you are so unlucky with this, but it might have to to with the words in the title, that get stuck in the spamfilter. The issue should be resolved now. Let me know if you're still having problems. Your content should be available now. Is there something we can do to avoid this issue or is it something that H5P is working to resolve? Same problem here. I tried relabelling too but I'm still getting the same issue in firefox (where I'm not logged into my H5P account) but its showing in Safari (where I am logged in). I'd send the links to the blocked content but there are quite a few of them. Luckily one of my colleagues picked it up before we pushed the course to go live! Anything I can do to make the content display and avoid it happening in the future? It seems to only be affecting things that were created in the last couple of days... does that make sense? Yes i think it is in the last few days. My content was an interactive video with embedded Vimeo. I have completed quite a few of these over the past year and there have been no problems. I can view it on Chrome on my Mac and PC but not in Safari, Firefox or IE. Getting a bit anxious now as we have paying students who will need this very soon to complete an assessment task. Hoping that someone out there is addressing the root problem. Changing content names has not helped. I have named them the same way as past nodes, so I don't know why this problem suddenly came up. It is not going to be sustainable for users to report issues with specific content nodes and wait for these to be manually fixed. There is probably something wrong with the H5P spam filter. Could we please get an update and some assurance from the H5P team? Content created by teachers for meaningful use shouldn't be subject to the tyranny or unpredictability of a spam filter! We will have a look into the spam filter rules and try to prevent this from happening. In the mean time, if you discover any content that's unavailable please share the link and we'll get it published asap. Hi. I have a problem. On the PC, and Mac the content displays, but when i want to check the content on IPad, it shows Content not Available. Can you check and republish it? It seems that content is not available when not logged in with my h5p account, so it cannot be accessed by my students on my LMS and other websites. Changing title or cloning the activities didn´t work. Also, I realize now that new activities I create have all the same problem and cannot be accessed unless logged in h5p. Any help with this problem would be really useful! Thank you very much for your help, the problem is sorted now. Setting up for this year and noticed one of my nodes are not working: could this be corrected? Are you sure you didn't accidentally delete the content? I'm not able to locate the node with your number. Ohhh crap; was looking at a Moodle page when I saw the content unavailable message; then realised I set up a new acitivtiy when I was having issues with the spam filter last year. So sorry for wasting you time on this one. Don't sweat it :-) If you have any other concerns feel free to post in the forums. I was able to access the content and embed it. Also please be informed that it is always advisable to host your contents using your own server. I've tried renaming, need assistance with this content not being available. I apologize due to spike in spam we recently re-enabled a stricter spam filter. Your content may have been unplublished. I have tested it and I was able to embed it. Hi; I encountered the same problem (Content unavailable) with content I'm creating using the open source version of H5P, installed on our own secure server under Wordpress. We're running VH5P ersion 1.11.0, on WordPress Version 4.9.8, and PHP version: 5.6.30. I've only created a few interactivities. The first few I created still successfully show up when I embed them in them in our separate LMS; but when I try and create new interactivities, they now result in the 'Content unavailable' error. This happened once before; I reinstalled the plugin and the first few showed up properly again when embedded, but now the error has reoccurred. I can still go back to the first few I created and successfully embed them, but the new ones have the error. 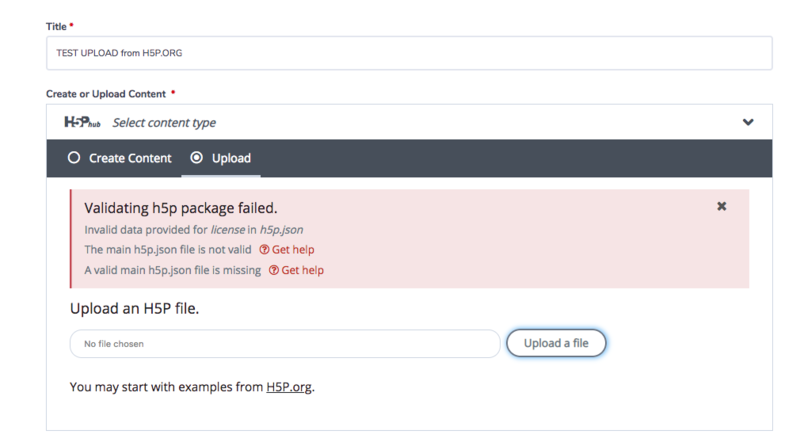 Also, it may be unrelated, but when I try and upload one of these interactivities to H5P.COM (which I am also currently evaluating), I get the following error for even the interactivities that work. For the unable to upload content can you please attach a sample content here. It happens every time I try and embed content on an external site. Initially, after installation of the plugin, it worked fine, and the few interactivities I made (multiple choice questions) then even now continue to embed properly and show up on external sites. But when I create new content - such as a new MC question - it does not. 6. H5P content type and version (if a content type was used), and a sample URL or attached H5P. Multiple choice was made initially; a question set was made next and that produced the 'content unavailable' error; and newly created multiple choice questions now have the same problem. I haven't attached a screenshot as the above links are live examples. I hope this helps and suggestions from the community are also welcome. Thank you or the clarification. Are you using shortcode or embed code to insert content? The Content unavailable message will only appear if you're using the embed code and you don't have permission to view the content – or – the embed has been disabled. Go to Settings -> H5P and make sure the Display Embed button is set to Controlled by author - on by default, which is the default value. I also noticed that you are using an older version of H5P updating the plugin is always advisable. I tried what you suggested, and it worked... thanks! So I guess I was misunderstanding what the "Display Options" section means in an individual interactivity. I thought that disabling the display of the embed button within an interactivity would only hide the embed link, but not disable the embed functionality. I see now that the option you suggested - "Controlled by author - on by default" - works best, and then - instead of disabling the "Display Embed button" checkbox itself - I should instead disable the display of the entire Toolbar for that interactivity by deselecting "Display toolbar below content". I'm glad it is now working for you. If you have additional questions feel free to post in the forums. In addition to my original reply, here is a screencuts of the upload error, as well as the two interactivities. Neither will successfully import into H5P.COM, but one of them is the original MC question I made, which even now still successfully embeds on external sites. Regarding the H5P.com issue - H5P.com haven't got the latest version yet. We add new H5P versions to H5P.com about two weeks after H5P.org gets them. It appears that we've had a number of items deleted.... as spam? Ugh! Could you please post the URLs of your contents so that we can check.